These Newport 384 Elevating Post- Z axis mounts are discontinued by Newport and are very hard to find, but sometimes these just do the job best. 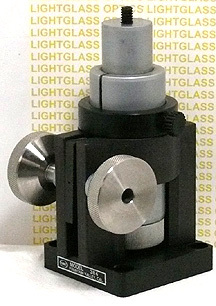 The base is slotted to accept the 1-1/2" diameter post-which has a knurled knob at the bottom to elevate the center post. You can roughly adjust the height of your optic mounted on the top of this post, lock it into place and then finely adjust it into position. This is a solid mount, without wobble.